A properly applied stain is part of regular maintenance to protect your deck from stains, mildew, the elements and damaging uv rays. 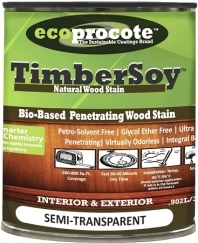 Stain products exist for every type of deck, including composite decking. Selecting the appropriate product to match the your deck material and applying it the proper way will ensure a long-lasting, great-looking deck that you can be proud of. Unprotected wood will turn gray and will eventually severely crack. 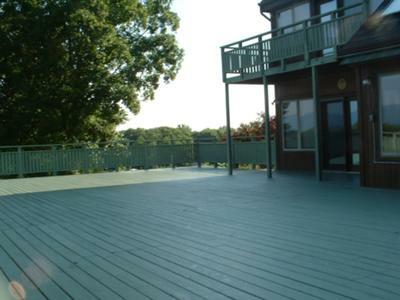 A deck should be restained every 1-1/2 to 2-1/2 years. You can test by pouring a glass of water on the wood. If the water beads up, it means the stain is still working. If the water soaks into the wood, it’s time to restain. Stains come in different transparency levels, from clear transparent, to semi-transparent, semi-solid and solid. A solid stain is more like a coating and may hide the grain of the wood while a semi-solid or semi-transparent stain will allow grain and texture to show through. Distributors may also add pigments to customize the color of the stain to match exterior features like fences, sheds or siding. Composite deck manufacturers sometimes recommend treating a composite deck with a protector or finish to guard against the stains, mold and mildew that can plague these decks.